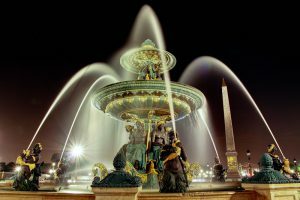 Place de la Concorde, one of the most popular squares—and the largest in terms of sheer size—in the City of Light, may be beautiful and picturesque today, but at one time it witnessed dozens of bloody executions during the French Revolution. In fact, it’s the exact site where King Louis XVI and Marie Antoinette were made a foot shorter on top via the guillotine. Visitors today, enamored of the square’s gilded fountains, soaring Egyptian obelisk and unfettered views of some of Paris’s most iconic sites, are probably unaware of the area’s decidedly grotesque past. Even the square’s name today—essentially The Place of Harmony—belies its dark history. Designed and built in 1755 by King Louis XV’s royal architect, Ange-Jacques Gabriel, at the end of the royal Tuileries Gardens, the space was created as a moat-encircled octagon and named after the reigning king. As such, it was adorned with an equestrian statue of Louis XV that was commissioned in 1748 and sculpted by such renowned French artists as Edme Bouchardon and, following his death, Jean-Baptiste Pigalle. The construction project also included the building of two identical stone buildings at the north end of the square. Today, one houses the nation’s naval ministry and the other is home to the luxurious—and outrageously expensive—Hotel de Crillon. But after the revolutionary uprising in spring 1789 that ushered in the demise of the monarchy and the arrests of hundreds of members of France’s aristocracy, the site was renamed the Place de la Revolution and a guillotine was erected in the center of the newly public space. It was here that King Louis XVI was executed on Jan. 21, 1793, and his wife beheaded later that year on Oct. 16. At least a dozen other notable French leaders and aristocrats were guillotined here as well, usually surrounded by hundreds of Parisians screaming for bloody “justice” as they cheered on the executions. 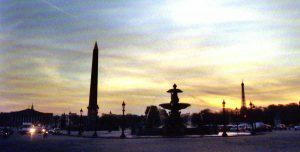 In 1795, the newly formed French government renamed the square Place de la Concorde as a measure aimed at quelling public unrest and fueling reconciliation among a populace that had grown weary of what had morphed into the violent Reign of Terror. Except for a time when the square was regiven a royal moniker during the 16-year restoration of the monarchy in the early 1800s, it has retained that peaceful name ever since. 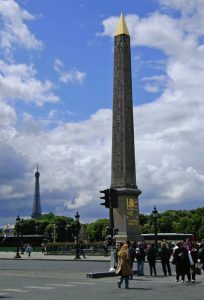 Today, visitors to the square are treated to some of the most stunning ornamentation in all of Paris, including the giant 3,330-year-old Obelisk of Luxor—a gift from Egypt to France in the 19th century; the Maritime Fountain at the South end of the square; and the Fountain of the Rivers on the North edge. 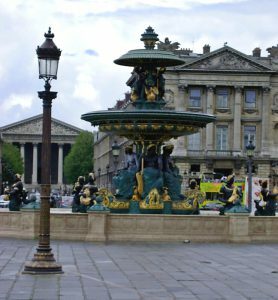 The two fountains are considered iconic representations of post-Revolutionary French ornamental design and architecture. Strolling around the 19-acre square also offers views of a number of the City of Light’s most recognized sites, including the famous Champs-Elysees, capped by the Arc de Triomphe in the distance; the aforementioned Hotel de Crillon; the exclusive Rue Royale, including Madeline church; the Tuileries Gardens; The Jeu de Paume and l’Orangerie museums; the Palais Bourbon, home of the National Assembly; the Seine and the Pont de la Concorde crossing it; and off in the distance the majestic Eiffel Tower. Don’t forget your camera! These views are considered by many to be unparalleled anywhere in Paris, especially at sunset. But if you want the square more to yourself, come at dawn before the crowds of tourists—and seemingly endless flood of cars and buses—arrive. The easiest access to the square is via the Metro, exiting at the Concorde stop. Although we tend to prefer to exit at Madeleine, explore that nearby Romanesque church and the exclusive shops surrounding it, then walk south down the Rue de Royal—with perhaps a quick visit to the Laduree pastry shop and a quick peek inside the famed Maxim’s restaurant—before reaching the sprawling square. Hours: Access is available 24/7, but beware of throngs of commuting pedestrians and an endless sea of cars between about 8 and 10 a.m. and again from 4 to 7 p.m. This entry was posted in Architecture, Beauty of Paris, Famous Paris destinations, Fountains, French history, French Revolution, History of Paris, Louis XVI, Marie Antoinette, Royalty and tagged Ange-Jacquest Gabriel, Edme Bouchardon, Fountain of the Rivers, Hotel de Crillon, Jean-Baptiste Pigalle, Maritime Fountain, Obelisk of Luxor, Place de la Concorde, Place de la Revolution, Place Louis XV by Bob Adams. Bookmark the permalink.